Bambounou is a key figure in the Parisian music scene, known for his genre-bending productions and experimental DJ sets. He's released two albums and a run of five EPs for Modeselektor's 50Weapons. His music converges at an intersection between house, techno and bass. During this event, we’ve given him free rein of an intimate four hour set. 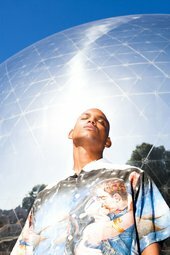 Bambounou has produced remixes with Laurent Garnier, Jessy Lanza and Sampha, and collaborated with Margaret Dygas and Simo Cell. He regularly performs at the likes of Berghain/Panorama Bar, Concrete, MoMA PS1 and Nuits Sonores. All ages are welcome to attend the event. Please note there is achallenge 25 policy at our bars.